For seven centuries, from the late thirteenth century forward, eyeglasses were the only way refractive vision errors could be corrected. The use of contact lenses followed in the 1950’s. Today, there is a surgical solution for the correction of most types of vision problems called refractive surgery. LASIK (laser-assisted in situ keratomileusis) is one type of refractive surgery that is used to correct common vision problems such as nearsightedness, farsightedness and/or astigmatism. Refractive surgery either eliminates or lessens the need for prescription eyeglasses or contact lenses with typical results being 20/20 vision without glasses or contact lenses. If the patient still needs eyeglasses or contact lenses after refractive surgery, the prescription will be measurably lower than before the procedure. Nearsightedness (myopia) is a vision impairment that causes objects near to you to be seen distinctly, but objects farther away appear blurry. Individuals with this condition may squint or partially close their eyelids to focus, sit close to the TV or movie screen, or sit in front of the classroom. It may cause headaches from eyestrain and difficulty seeing while driving especially at night. Children with myopia often seem unaware of distant objects, rub eyes repeatedly and blink often. It is most common in people under age 40. In this condition, the cornea and lens bend (refract) incoming light rays so they incorrectly focus in front of the retina instead of directly on the retina. Myopia occurs when the eyeball is too long or the cornea or lens is abnormally shaped, preventing the incoming light from focusing directly onto the retina. Farsightedness (Hyperopia) is a vision impairment that causes distant objects to be seen more clearly than objects that are close. It can cause headaches, eyestrain, squinting, and blurry vision particularly for close objects. In this condition, the cornea and lens bend (refract) incoming light rays so that they incorrectly focus images behind the retina instead of directly on the retina, often resulting in blurred vision. Hyperopia occurs when the eyeball is too short or the cornea or lens is abnormally shaped, preventing the incoming light from focusing directly onto the retina. 1Astigmatism is a vision impairment that causes blurred or distorted vision to some degree at all distances. It can cause eyestrain and headaches after lengthy visual tasks such as reading or studying. There are three types of astigmatism: Myopic, Hyperopic, and Mixed astigmatism.In this condition, the cornea and lens bend (refract) incoming light rays in such a way that they never come to a single focal point on the retina. Instead, there are multiple focal points either in front of the retina, behind it, or both. An irregularly shaped cornea is usually the cause of astigmatism. The cornea should have a round shape like a baseball, but in this condition is shaped more like an American football. An irregular shape of the lens inside the eye can also be the cause of astigmatism. This is called lenticular astigmatism, as opposed to the more common corneal astigmatism. Astigmatism may also be the result of an eye injury. In this condition, the cornea and lens bend (refract) incoming light rays in such a way that they never come to a single focal point on the retina. Instead, there are multiple focal points either in front of the retina, behind it, or both. An irregularly shaped cornea is usually the cause of astigmatism. The cornea should have a round shape like a baseball, but in this condition is shaped more like an American football. An irregular shape of the lens inside the eye can also be the cause of astigmatism. This is called lenticular astigmatism, as opposed to the more common corneal astigmatism. Astigmatism may also be the result of an eye injury. LASIK uses a laser to create a thin flap in the cornea. The cornea is the transparent cover and outermost lens that focuses the entry of light into the eye. It refracts or bends light, beginning the refraction process that allows an individual to see. The surgeon folds back the flap in order to reshape the curvature of the cornea to alter the way light rays enter the eye to improve, restore or create better eyesight for the patient. Although LASIK is the most popular type of refractive surgery in the United States, there are other types that might be a better choice for some individuals such PRK, LASEK, e-LASEK, Corneal implants or intraocular lens implants (IOL) that also can refocus light rays and improve vision. Who Can Have The Surgery? The LASIK procedure is only for adults 21 years or older (18 for myopia). It usually takes about ten minutes and does not require general anesthesia. Eye drops are used to numb the surface of the eye so the patient does not feel pain when the laser is used to create the eye flap. A slight feeling of pressure may feel uncomfortable for a moment but is not associated with pain. It is common for some surgeons to administer a mild sedative or other medication prior to surgery to promote relaxation during the procedure. The recovery time for LASIK is usually within two days but can be up to seven days when most patients notice the improvement in their eyesight. Each patient may have a different experience after LASIK surgery. Some have reported a mild stinging sensation, while others experience moderate pain. Even so, LASIK is reported to have a 96% rate of satisfaction defined by the patient’s improved vision quality according to the Journal of Cataract and Refractive surgery. The greatest benefit to LASIK is that reshaping the cornea to correct near or far sightedness will usually last a lifetime. However, a patient’s eyes can change with time. Ten years after LASIK, almost ten percent of patients may require another procedure to maintain their improved vision. In most cases, LASIK surgery can be safely repeated. The chances of developing complications from LASIK eye surgery are very low. Some patients experience dry eyes due to the temporary decrease in tear production. Others experience difficulty in seeing in dim light, at night or in rain, snow, or fog. Occasionally, post-operative patients see halos, glare, star bursts, have double vision or light sensitivity. Swelling, inflammation, infection, and/or eye pain can occur. In very rare instances, patients experienced a temporary band of light in their peripheral vision. Severe complications, including significant vision loss, have been reported but are extremely rare. Nevertheless, most post-surgical complications can be easily managed. For example, if light sensitivity is the problem, eyeglasses with photochromic lenses will relieve the symptom. Also, if you still have a small lingering refractive error after surgery, light prescription lenses having an anti-reflective coating can sharpen vision for night driving, for instance. In LASIK, the eye surgeon uses either a microkeratome or a femtosecond laser to penetrate the cornea and create the thin circular flap that allows the doctor to access the stroma. He then uses an excimer laser to remove some corneal tissue. This is a highly specialized laser that uses a cool ultraviolet light beam to remove minute quantities of tissue from the cornea so that it can be reshaped to correctly focus light onto the retina for improved vision. Nearsightedness requires the cornea to be flattened. Farsightedness requires the cornea to be steeper. To correct astigmatism, the excimer laser is used to smooth the cornea into the normal shape. Before some LASIK procedures, a 3-D map of the patient’s eye is created to provide an in-depth representation of any refractive errors using highly precise measurements. This allows the surgeon to correct the corneal curvature with precision. After reshaping the cornea, the surgeon lays the flap back in place to cover the area where tissue was removed. The cornea then is allowed to heal naturally. Post-surgery, caffeine should be avoided as well as all foods that would make it difficult to sleep, e.g. sugary foods and drinks. Due to the temporary decrease in tear production in many patients, drinking plenty of water will keep the eyes moist and make the eyes more comfortable. Sleep after the surgery is essential. Arrangements should be made to be driven to and from the location where the procedure will be performed since the patient will be somewhat groggy and will have blurred vision after the surgery. Light physical activity is permitted, but strenuous activity should be avoided for a week after surgery. What Is The Cost For LASIK? In the United States in 2017, the average cost of LASIK surgery was $2,088 per eye, according to a report prepared by a leading vision care industry analytics company. However, lower and higher prices are recorded on a number of websites. Prices will vary depending upon the exact procedure performed and the location of the clinic or hospital. According to the 3iLasik website, the cost for the procedure, for instance, is approximately $1200 per eye. Who Are The Best Candidates For LASIK? Generally, a suitable LASIK candidate has healthy eyes, stable vision that has not changed for at least one year, is at least 18 years old for treating nearsightedness and at least 21 years old for treating astigmatism, does not have a degenerative or autoimmune disease or any condition that hampers the healing process, and is not pregnant or nursing. 4LASIK should not be performed on individuals with autoimmune or any immunodeficiency disease due to the fact that those conditions affect the body’s ability to heal. Pregnant or nursing mothers should not have this procedure nor should those with evidence of corneal thinning. LASIK should not be performed on anyone taking medications with eye-related side effects, such as Isotretinoin (Accutane®) for acne treatment or Amiodarone hydrochloride (Cordarone®) for normalizing heart rhythm and is not recommended for those with diabetes, a history of herpes simplex or herpes zoster keratitis, significant dry eye, or severe allergies. You must disclose to your doctor any eye-related conditions, injuries, or surgeries you have had, any changes to your vision in the past year, and all medications and herbal and vitamin supplements you are taking so that your doctor can accurately determine if you are a candidate for LASIK. The main difference between LASIK refractive surgery and another popular refractive surgery, PRK (photorefractive keratectomy) is that the recovery time for PRK is longer (several days to several weeks) and there is a slightly higher risk of eye infection. PRK is best used on patients that are ineligible for LASIK. Also, for some people PRK offers advantages over LASIK. To understand what advantage or disadvantage PRK has compared to LASIK, the surgical procedures can be compared. In the first step of LASIK, a flap is created on the cornea with a laser and is lifted to expose the corneal tissue. Then it is re-positioned after the reshaping is complete. In PRK, the outer layer of the cornea (epithelium) is completely removed and discarded before reshaping the corneal tissue. The epithelium grows back over the corneal surface within a few days after surgery. A soft contact lens is placed on the cornea to help protect the eye during this period. After the epithelial cells grow back, the eye doctor removes the soft contact lens. (This accounts for the longer recovery time and the greater risk of infection attributed to PRK.) Some patients have both eyes corrected on the same day while others have the second eye treated a week or two later. PRK may take days or even weeks before eyesight improvement can be noticed, and longer for vision to stabilize. It can take from three to six months before eyesight is completely clear and stable. The advantage of PRK surgery is that because the procedure does not create a corneal flap, the entire thickness of the underlying stroma is available for reshaping. This is a distinct benefit if the cornea is too thin for LASIK or if LASIK surgery has been previously performed leaving the remaining cornea too thin. Another advantage is that in PRK there is no risk of flap difficulties and less risk of compromised corneal thickness (removing too much of the cornea with the excimer laser). After PRK, topical antibiotics, anti-inflammatory drugs and pain medication will be prescribed, which will promote healing, curtail swelling, and reduce discomfort. The prescribing doctor will carefully monitor the healing process for several weeks. LASEK (Laser-Assisted Sub-Epithelial Keratectomy) is another refractive surgery technique that is available that includes a little of both LASIK and PRK. Instead of removing the outer epithelial layer of the cornea and discarding it as is done in PRK, the epithelial layer in LASEK is preserved and re-positioned on the eye’s surface after the reshaping of the cornea is complete. In LASEK surgery, the hinged flap is only created in the epithelial layer of the eye as in PRK using a surgical instrument called a trephine. The LASEK hinged flap is much thinner than the corneal flap created in LASIK (which contains both epithelial and deeper stromal tissues). In another procedure called epi-LASEK or e-LASEK, the surgeon uses a blunt, plastic blade to separate the epithelial from the eye instead of using alcohol as is done in LASEK. This avoids the possibility of a reaction from alcohol, which can kill epithelial cells. In all other aspects, it is very similar to LASEK. The outcomes of PRK, LASIK and LASEK surgery have high success rates and similar vision results. In each type of refractive surgery, most people achieve 20/20 vision and nearly all patients attain 20/40 vision or better. Possible corneal flap-related complications of LASIK are avoided by the PRK and LASEK techniques. In addition, the possibility of removing too much corneal tissue with the excimer laser in LASIK is avoided in both PRK and LASEK. By avoiding a deeper flap as in LASIK, there is also somewhat less of a risk of developing dry eyes after LASEK. LASEK may be a better option than LASIK if there is a high degree of nearsightedness, which requires a larger amount of tissue removal to correct the refractive error, or if your occupation or activities put you at high risk of eye injury, risking the dislodging the corneal flap created in LASIK surgery. Often, however, the LASIK procedure is chosen because PRK and LASEK typically involve more discomfort and a longer recovery time compared with LASIK surgery. Discussing your particular situation with your eye doctor will enable him/her to determine the safest procedure for you to obtain the best results. Chances are you have probably heard of LASIK eye surgery unless you have been living under a rock for the past 20 years. LASIK stands for Laser-Assisted In Situ Keratomileusis and is the best known and most commonly performed procedure to correct vision problems so you no longer need to wear eyeglasses or contact lenses. LASIK is refractive surgery that actually changes the shape of your cornea. This is done to correct your vision. 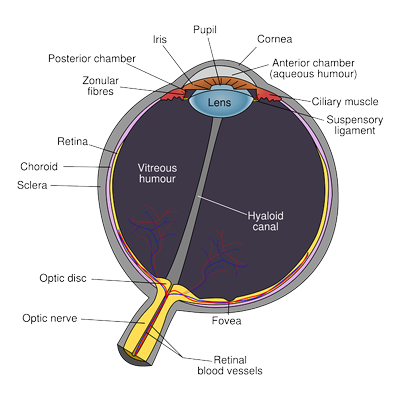 The retina is a layer at the back of the eye which contains cells that are sensitive to light. In a normal eye images are in clear focus due to the light rays being properly bent but when the light rays are not properly bent the light ends up being focused elsewhere which results in blurry vision. Traditionally contact lenses or glasses have been used to refract or bend the light rays and how that is accomplished is based upon weather you have hyperopia or myopia. These are the fancy words for being farsighted or nearsighted. Lets face the facts, any form of surgery is going to have risks. Not having surgery can have risks as well. Not being able to see well whether you are driving, walking down the street, or operating equipment at work can pose some serious risks if you can’t see well.